Though the biblical story of the Virgin Birth of Jesus first appeared in the gospel of St. Luke, it wasn't until the fourth century A.D. that worship of Mary began. Still more centuries would pass before artists were officially allowed to paint images of the Virgin. At first, these were more symbols than portraits as the Church prevented the faithful from dwelling on the female form. But, as the Middle Ages evolved, the idea of depicting a woman of great purity who had given birth to the Son of God underwent a transformation. The patriarchal Church could not resist popular sentiment that saw the Virgin as a mother who worked vigorously to protect and nurture. Soon the Madonna's feminine figure – her face, her hair, feet, hands, her expression and tender nature – became an immensely popular subject in religious art. But unlike pagan goddesses, the Virgin Mary was always shown clothed in ample garments – a bonus for painters eager to practice new methods of depicting folds and colors in fabric. Painting the Virgin also lead artists to experiment with more realistic, human qualities of tenderness and humility. At first, an opulent or otherworldly background populated by angels and saints surrounded the Virgin, even as her face remained typically calm in spite of great inner emotion. As Medieval art evolved, architectural forms and landscapes were added, and the use of shading and mass to suggest human shape steadily established itself in art – though, at first, bodies were dealt with in a flatter, more stylized fashion than were faces. The austere Madonna of the Large Eyes, considered a miracle-working icon, sat on the high altar of the Cathedral in Siena from about 1200 until 1311. A typical Byzantine Madonna, it was executed with dark outlines and simple geometric forms, and layered in gold so as to be easily seen within the candlelit cathedral. The artist did not try to make the figures look realistic, but depicted them as flat and without perspective. He also followed the tradition of using the size of figures to establish their relative importance. Rucellai Madonna (Duccio, 1285)During this era, images of the Virgin and Child lacked interaction between the figures. Here, the Virgin is seated on her ceremonial throne, as she and the Child, sitting directly in front, stare impassively out toward the viewer. The sanctity of these figures is further emphasized by hovering angels holding censers, and the icon's importance was originally enhanced by gems in the Virgin's halo, throne and footstool. One of most important and sensitively executed works of late 13th C., Duccio's Ruccellai Maddona bridges the still-Byzantine artistic culture of Siena with that of Florence, a city then on the cutting edge of a humanistic approach to painting. Although the panel's iconic Byzantine style seems to exist on a purely spiriutual plane, there is a new suggestion of volume in the Virgin's head and body, emphasized by the gold edging of her robe, lending a feeling of depth. While known as a master colorist, Duccio also gave his figures a greater weight and solidity than had previously been seen in Siena. Duccio's throne is also solid and ornate – the footrest and gable both have an arched design – and he used perpective on the right side of the throne, which is angled realistically backward. Unlike older icons, the angels holding up the throne no longer form a solemn background, but are individuals, each looking directly at the Virgin, bringing their own emotion to the scene. Also suggesting a new sense of spatial depth, the halos of the lower angels are half-hidden behind the throne while their hands touch and caress the sides. 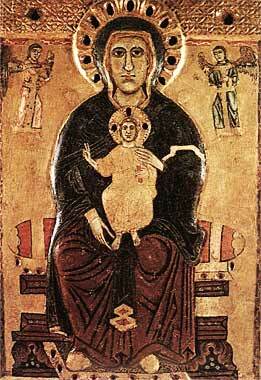 The Virgin also clearly belongs in the material world, as she supports her Child on a powerfully modelled knee. 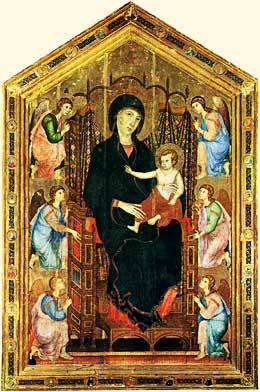 Duccio's revolutionary work makes earlier Madonnas appear primative through its sheer spatial complexity. In the work of Giotto, figures cease to be abstract symbols. The Ognissante Madonna (Giotto, 1310)In this Madonna from the Florentine church of the Ognissanti, characters become solid forms, have weight and fill natural space. Like Duccio, Giotto portrays a formal image, with both the Virgin and Child gazing out toward the spectator as the Christ Child gives his benediction. Yet much has changed. 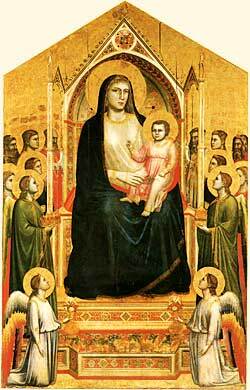 In Giotto's hands, the Byzantine style was nearly abandoned. No more lusterless eyes, attenuated hands and missing shadows. His figures, as well as scenic elements, began to take on a new vivacity. Characters lived in a palpable, realistic world. Giotto's early experiments into the art of foreshortening, as seen in the turn of the central characters' heads, also contributed to the naturalistic feeling. The sad, remote Virgin of Duccio's panel has now been turned into a very human woman who gazes at us serenely while holding her son in a realistic position. Giotto modelled his Madonna in full three-dimensional terms and place her in a natural setting, anchoring her firmly to the ground. His use of white highlights on Mary's lap and chest suggest a physical bulk and presence, one which holds the attention of the surrounding angels, who also occupy physical space. The angels, while still symmetrically arranged, are each subtly different in expression from their counterpart. The throne of Mary is, for the first time, conceived as a delicately designed, architectural structure. It not only adds depth but also projects the main figures toward the viewer. Through the use of elementary perspective on the steps and canopy, the throne also appears to recede in space. The clearly directed gazes of the surrounding figures also make the Child's gesture of benediction appear as the focal point, both optically and compositionally.We are no longer simply onlookers, but participants in a holy, yet believable scene. Giotto's realism broke the bonds of iconic art, his humanistic style was the true forerunner of Renaissance painting. 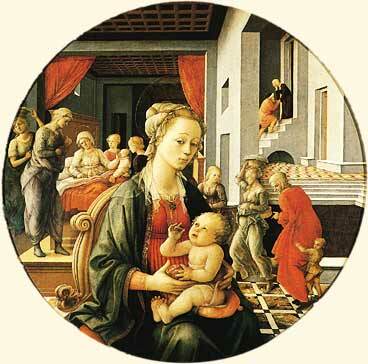 Fra Filippo Lippi was an orphan brought up in a convent, persuaded by his elders to take vows. Yet he soon caused a scandal by running off to marry a nun. The Medici family, who admired his talent, used their powerful influence to have the couple freed from ecclesiastical control. Lippi's Madonnas are holy and serene, but his crowd scenes are composed of everyday men, women and children as he observed them. Lippi was one of the first 15th c. Florentine painters to exploit innovations in perspective introduced by Masaccio in the early 1400s. He combined his skill at perspective with a graceful style, bringing a new feeling of humanity to religious subjects. With a freedom and liveliness, Lippi created a convincingly handled perspective along with a new humanization of the characters, using careful shading to make objects appear round and real. Madonna and Child with Stories from the Life of St. Anne, one of the earliest known tondos, shows the Virgin holding the child with scenes from her life portrayed in the background. Her parents, Anne and Joachim are off to the right, the story of her birth appears on the left. Lippi employs a new spatial perspective to create several distinct planes of action in this receding composition, and there is an interesting alternation of open space with volume. Though he does not seek to coordinate figures in the foreground with the lively action in the background, the picture's many planes are connected and its depths heightened using a precisely constructed grid. All lines meet at a vanishing point near the Virgin's right eye. A beam of light from a window at the upper left also follows the same perspective. This use of strict mathematical perspective to create an illusion of realistic space and depth was – along with foreshortening, emotion, gesture, lifelike faces and realistic landscapes – a distinguishing feature of the new Renaissance art.